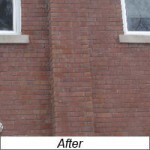 Tuckpointing in Toronto - Excellent work, outstanding customer service | Wilkens Contracting Inc.
Tuckpointing is carried out mainly for aesthetic and/or maintenance reasons, with most of it being done to just the deeper washed-out joints and holes in the mortar between the bricks. We carefully tint our mortar before applying it to the joints, where we then texture its surface so it blends in with the existing colour and shadowing. This procedure creates a seamless appearance between the old and the new, without leaving a patchy looking wall. Some of our clients want every joint ground out and re-pointed which gives a completely restored look. This is really only necessary when there have been many previous repairs done with varying colours or types of mortar, or if one would like to change the colour or style of the mortar throughout. Does your home need tuckpointing? Hi, the repair was done on my house yesterday. What a great experience. The workman was pleasant and courteous, and you should be proud to have him as an employee. the job is perfect, as I must say I am a bit of a perfectionist, and I don’t offer this kind of praise often. We’d like to thank you and your workers for a job well done. 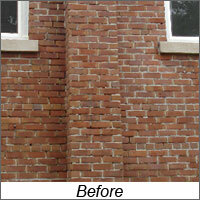 The tuckpointing between the bricks was very neat and an excellent job was done blending the new mortar to match the existing mortar. We also greatly appreciated the professional written estimate that we were given, and the fact that the amount billed to us was exactly as estimated. We would not hesitate to recommend your services. When we require work done to our house, you are the company we will contact. Many thanks, Lisa and Dan. Thank you for completing the tuckpointing on my house. The men did a very good job and cleaned up afterwards. they even filled the extra holes for me. Thanks again, Ann.